Author: Roland Kießling. In collaboration with: Bong Marcellus Wung. Series edited by: Wilhelm J.G. Möhlig, Bernd Heine. 12 pp. Roman, 325 pp. 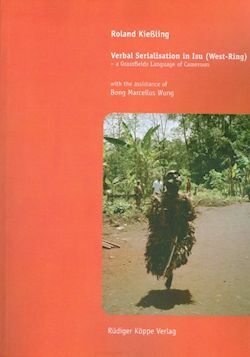 The present monograph provides a first description of verbal serialisation in a Grassfields Bantu language of Cameroon, Isu of the West Ring subgroup. It is taken from a larger project which aims at a unified polylectal grammatical description of all West Ring varieties. Even though verbal serialisation has become a vibrant topic in linguistics in general, as attested by major typological studies such as Aikhenvald 2006, and in African linguistics in particular, as attested by Lord 1993, it seems as if the presence of the phenomenon in the Grassfields Bantu area has gone largely unnoticed so far. The forms and functions serial verb constructions (SVCs) take in Isu may contribute substantially to the typological debate insofar as some of the peculiarities observed in Isu seem to call for a revision of some of the generalisations in Aikhenvald 2006. The corpus on which this study is based consists of eight narrative and fifteen dialogic texts of various lengths plus extensive supplementary elicitations. After a general introduction to Isu within the West Ring context in Chapter 1, Chapter 2 discusses prototypical properties of SVCs in a general perspective and spells out diagnostic criteria for determining Isu SVCs in delimitation to other multi-verb constructions. Chapter 3 outlines the distinction of symmetrical vs. asymmetrical SVCs which is dealt with in the following chapters in detail. Thus, while chapter 4 is devoted to basic properties of symmetrical SVCs, section 5 zooms in on asym­metrical SVCs and their properties with respect to the marking of central grammatical categories such as person of participants, tense, mood and modality, neg­ation, focalisation, nominalisation and number (single marking) vs. aspect, sub­ordination and mood (concordant marking). After SVCs have been delimited from other multi-verb constructions, chapter 6 addresses the problem of delimiting SVCs from verb-compounding. Asymmetrical SVCs form the focus of chapter 7. They are discussed according to the target functions the semantically de­pend­ent coverbs take in them. Chapter 8 ex­plores the rise of grammatical categories from asymmetrical SVCs under three major perspectives: morphological, syntactic and semantic. The conclusion in chapter 9 sets out to summarise the salient features of a West Ring type of serialisation, as they emerge from the Isu case study presented in the preceding chapters. The appendix lists the Isu coverbs and hybrid adverbials in alphabetical order. Two broad traditions have emerged in the serial verb literature, not necessarily in conflict. One has focused on the hierarchical syntactic representation of serial verb constructions (SVCs) within a mostly generativist framework, whereas the other has focused on what meanings SVCs are used to express, situated within a more functionalist approach. Tying these two approaches together is the goal of establishing clear criteria for classifying different types of SVCs, as compared to other types of multi-verb constructions. Kießling’s indepth investigation of verb serialization in Isu can be placed squarely in the latter tradition, and is a welcome and valuable contribution. We have found this monograph to be well-organized, thoroughly argued, extremely well-exemplified, and quite theoretically intriguing. This book should be of most interest to those with areal and typological investment in Cameroon and West Africa, but it also provides an invaluable case study for theoretical syntacticians and semanticists, as well as cognitive linguists (particularly its discussions of metaphorical extension).